Could we PLEASE get the fame required to join a flag bumped up to what it is on normal oceans? Not to create, just to join. Do not want a flag stop sending invites. Apparently that isn't enough since you can invite at Aspiring at the moment. Erm, thanks for identifying the problem, but that's not the solution. Fame to join should be very low so that very small family crews can combine, and have their youngest members unable to read officer & flag chat. What you want is a "no invites" or "flagless crew" or "remain independent" checkbox. This might be technically implemented by having a superflag "Unaffiliated" in the database, with another hack to disallow flag chats, and a third to not have a flag page with those crews, and then a little one to change "Crew X of the flag Y" to an appropirate text, such as "Crew X, independents". War dec 'em. Oh, wait. No sinking. Can you even declare war on Crimson? If so, what's the point? It would fix the problem I'm having of being invited every single day because you only need to be Aspiring to be invited to join a flag at the moment. You get Aspiring on crew creation. Aspiring is what I in my at the moment one person crew will be sitting on for a while, so bumping the fame required up to Renowned to invite people WOULD be that "No invites" that I want. However, that only fixes the problem, perhaps only temporarily, for you. It's a band-aid. What I suggested is a more structural (GD) type situation which ensures that when you do happen to get that fame, you don't suddenly have to start going "oh noes, gotta play less so we don't keep fame too high". It should be a very low requirement, but not the absolute minimum, of fame to join OR create a flag, so that (for example) two mothers (sisters, perhaps) who know each other but don't play much can make an alliance for their kids of all ages. The problem is that "invite X to join your flag" is yet another Irresistible Shiny Button. It will be pressed, constantly, by anyone and everyone who is allowed to. Childproofing an entire ocean is a lot of work. Agreed. I am already in a flag, feel no reason to move, yet I get multiple requests each day. I had 6 requests from one flag, 5 from the same person spaced about 5 minutes apart. Definitely looks like Shiny Botton Syndrome. i never understood why you need a requirement to join a flag anyways, make one sure but join one? if you don't want people to invite you to their flag pvp them when they ask you it will keep them away :). This is one change i would like to see on main oceans. If asking crews to join would get them to pvp me on Crimson I would start now with inviting every crew that looked decent. Well I had hoped, being a beta set up ocean for family involvement the doubloons would be kept at a static price for all, especially kids to use and have fun with, however with the doubloon exchange working the same as the main oceans to date they are racing up to the same silly prices seen on the other oceans. When Crimson was set up it should have been kept totally separate with fixed prices all round so that children could get a feel of being in a fun game and work to earn poe for things they wanted, where prices are reasonable and kept static. If they go into a real world shop to buy sweets today they don't want to see them double the price tomorrow, do they?, this is becoming a ripoff place already. One major problem is that kids don't have the same attention span as adults and i can't see my grand kids working their hides off hours and hours in the navy to buy dubs to get a badge to work in a shop so they can get more money when prices just keep going up and up. I think stall items should be fixed like in the palace and that herbs etc are all at set rates after all this is not a main ocean, and to be user friendly the game should play as user friendly, which it most definately is not at the moment. Come on developers think as a child when you design a place for kids to play with their parents rather than think adult and as place for parents to play with their kids. The 2 grandchilden I encouraged to start here, are already fed up trying to earn enough to buy a doubloon because the price is more then when they looked the day before. One was upset because he wants boots and is never going to earn enough to buy the doubloons he needs for them, the other desperatley wants a dog but with the poe and all those dubs required it will never happen unless i do it for him, I fear they will drift away to pastures new. Better still set up a subscriber ocean with things priced like on the Ice ocean, for family play with a subscriber discount for block purchase ( ie, family ticket to subscribe )like you find at theme parks, if parents want a place to be on line with the kiddies and enjoy all the sub features. Then the doubloon price problem goes away and prices will be so much more reasonable anyway. I completely agree about keeping Crimson separate from the other green oceans. As a player on Cobalt, I had hoped it would be a blue ocean, but no such luck. Nor does it look like it will happen. Personally, I have two children playing on this ocean with me. My son is 12 and old enough to wait out long term goals. My daughter is 7 and is having a hard time with it. Both are in the GDC but after badges there isn't remotely enough dubs to buy what they want. The dub sell rate has bounced between 1.4K to 2.6K in less than 24 hours. I want them to play and enjoy but they will not be on all the time trying to earn poe and the poe for dubs to buy something. Their time will be even more limited when school starts. Right now they just have to finish their chores (and you would not believe how quickly they've manage to accomplish that in the last two weeks!) before playing. Yes for a separate economy, or a one-way economy where dubs can not be transferred out of Crimson. I am with the last 3 posts here. I cried when I saw dubs hit 2000.. for all the young ones who will never experience the joy etc. of this game. I saw that bright fire engine red again. This is enough to discourage ME from playing here. How can I positively enourage my 3 grandkids to participate.. or work for anything. I certainly hope 000 has a plan . I hope this was expected and will settle out. I also notice that people who are trying to add a little life are being criticized openly in the forums. By Experienced People who are Beginning to sound like whiners to me. Party Poopers. If you feel you have something that will 'improve', 'contribute', 'clean up' etc. the 'event' PLEASE do so in private PM.s. Not all will be on every time with an older family member. Some may be here without real life family. They are Children. We need a shift in thinking. 3000k plus for one dub. Prays 000 knows what they are doing. Selling dubs were up to 30K yesterday. I have a printscreen but having issues getting an image link to work. I have seen repeatedly over the last few days this horrible trend. 2 @ 2900, 2 @ 2950, 2 @ 3000, and upwards. It's been in the 5K - 6K regularly as well. I know I'm from a sub but I AM playing here with my children. It is unrealistic to keep putting it up so very high. Someone is going to automatically click buy a dub and be very upset and very poor. Edit: Pictures working now thanks to a wonderful bird hearty. And right this moment the sell side is back down under 2k again. Someone is going to automatically click buy a dub and be very upset and very poor. 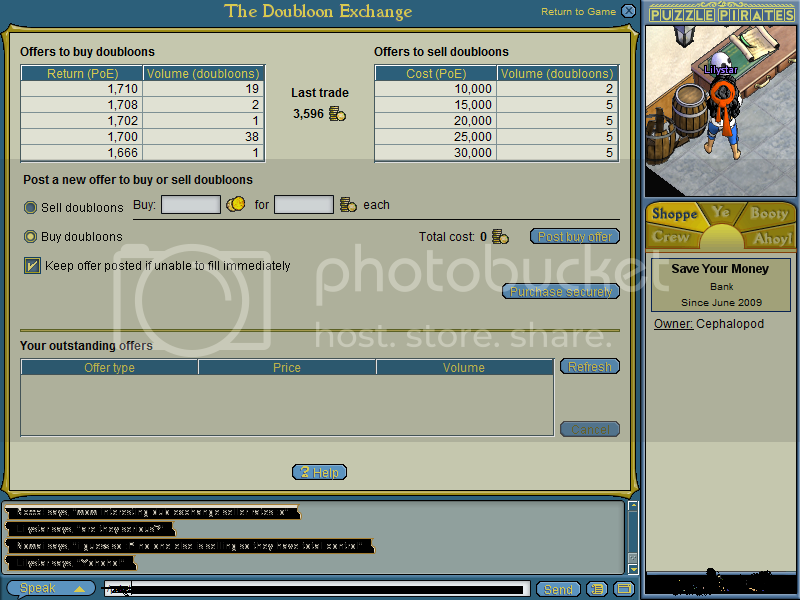 How about putting a limit on the amount you can spend per doubloon with the 'easy buy' option? "Arr! The price of doubloons be too high for a quick buy right now! Ye may may wish to put up yer own offer to get them cheaper. Click here <link to help screen> to find out how to do it." It wouldn't prevent those who know what they're doing from buying and selling at higher prices but it might protect the unwary. So the first thing my 12 year old did with her GDC dubs was go exchange some for cash. My daughter is a bit of an impatient clicker - if something doesn't load instantly, she clicks more. She managed to accidentally sell ALL 20 DUBS on the exchange within a few seconds, before I could even walk the 20 feet to her computer to show her how it was done. Fortunately, the exchange at the time was fairly even in value and she was able to buy half of them back. I suppose it was a learning experience, but I'd like a limit on how many you can sell at once, at least on Crimson, for such a reason. I agree .. put a limit on dubs selling and buying. Also, I have just spent and hour and half waiting for zombies to fill on dragon. Only to be booted. Then I look and the one they took was lagged out!!.. Well I would laugh.. but I am too tired. This is Crimson.. were little kids play. An hour and a half wait for zombies to fill is just ridiculous. Most kids don't even have that long to play! Either have fewer or after x time of so many pirates registered.. auto exit excess zombies and start the game. Can we please have the tells on consistently? We were friends once, but now you seem to not be your happy, sparkly, self. And we will continue to be at odds until you return to your happy, sparkly self. So, I guess I'm rated grand master in bilge on Crimson but I can't get the bilge down to save my life. When you first start to play it's pretty easy to get an excellent or incredible, just like all the other oceans. But it becomes increasingly more difficult and therefore very difficult to get the bilge down. Many players don't want to play the bilge puzzle because of this. It's honestly very discouraging. I think it's a population problem in the fact that not enough players have played it to establish a good curve. However, if there is any way you guys can scale back the difficulty temporarily that would be great. You know it's a problem when you can get players to easily fill the carp station but pirates really don't want to bilge. Also you know there's a problem if I'm rated Grand Master and there is low to no damage on a sloop and I can't get the bilge to budge. I'm not the best bilger in the world but I could usually accomplish that on other oceans, especially if you gave me a few leagues, I simply cannot do it on Crimson. And the best thing we have on Viri is legd. Maybe this is just some kind of population base problem, so I must say: if you do only singles on Viri, most likely you can only get a poor/booched (=learning), the bilge will be dying all the time. At least things are not like this on Crimson, at least. We did realized we rarely get sparkles after some days on Crimson. The Agent currently on Viridian is NOT me. The previous "Agent" was deleted due to no log-on record. Copylion on Viridian for new stuff and my crew, Crimson for my old school memories. The doubloons are going up again after the reset of prices by subscribers. So what will Crimson's economy look like? Doubs at 1k at the very beginning of every month, slowly goes up until reaching 30k@? /e puts him out of his misery...your name is in your signature mate. I have just confirmed these are not operational, so why are they hiring workers? The pay scale was set, the shoppe was opened for business and set to hiring, but they sell no products and buy no commodities. This just lures people in for the relatively decent pay, on the assumption that shoppes always, or at least often, have orders. If the ships aren't going to be turned on for ordering, at least turn off the Now Hiring button. This just sets people up to be disappointed, especially on an ocean where it can be assumed the pirate won't know how to check if they have been paid, or if it is even probable that they will be paid.